Looking to fill your evening with a bit of fun and adventure with nature. Join them on Australia's only 4wding Rainforest and Glow Worm Tour. Experience the Rainforest come alive after the sun has set. Frogs, Geckos, Crickets, snails, Glow Worms and more. This is Gold Coast's most comprehensive Nocturnal Rainforest and Glow Worm Tour. The National Park and Waterfall they visit is different from all the others, no large coaches or tour groups, Just us. Less people, more wildlife! This tour is not just about the Glow Worms in their natural environment but the journey to them. Tour includes 4wding, Guided rainforest walk, evening supper, National Park fees, Hotel Pick up and drop off. All their tours include free WiFi in vehicle. A short distance beyond the beaches another paradise awaits, Nature's Paradise, Tamborine and Lamington National Parks. The all inclusive tour gives you the chance to experience the area with you private guide including morning tea and lunch venues that are exclusive and private to Southern Cross 4WD Tours with big meals to fill any appetite. A morning guided walk through subtropical rainforests to waterfalls and then in the afternoon a visit to Lamington National Park and the O'Reilly's Rainforest Retreats famous canopy treetop walk. Wine tasting, gallery walk (arts and crafts centre), swimming in local rock pools, bird feeding, 30 metre observation tower climb, off-road driving, boomerang throwing and more, a proven tour since 1994 will see you out in stunning countryside with a family run business. Discover waterfalls cascading into mountain streams, thick green rainforest alive with native birds and animals and the rugged hillside trails on Tamborine Mountain. Sighting of kangaroos in the Tamborine area is common and not to forget the koala who are often seen sleeping the day away in the gum tree beside one of the rough bush tracks. On the half day tour with Southern Cross 4WD Tours, you have the opportunity to explore the shops on Gallery Walk, taste some local wine, learn to throw a boomerang and experience a guided rainforest walk with a friendly, knowledgeable local guide. This tour is ideal for anyone short on time or wanting to make the most of time while on the Gold Coast. This is the ideal tour for anyone wanting to get out into the Gold Coast Hinterland and not have to worry about time restraints and truly see what you want to see. There is plenty to do in the area so they can just make it up. 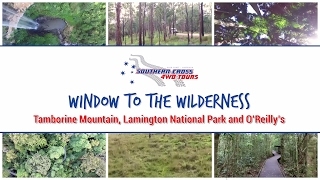 Consider Southern Cross 4WD Tours your personal drivers for the day. It works out cheaper than the full day tour if there is a small group. Ideal even if you just want to do the normal Full Day tour but knowing that if something takes your interest as you journey through this stunning area the itinerary can be adjusted accordingly. Pre-arrange an itinerary or just take it as it comes. 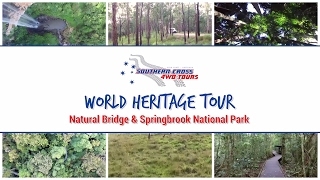 Tamborine, Lamington and Springbrook National Park specialists.